We arrived at the airport and took an Uber to our Airbnb in Hollywood; conveniently located just behind the Chinese Theatre in central Hollywood. Tired and exhausted we got a Dominos delivered and left the sightseeing for the next 6 days. In the morning, Mike took the drone out of town to a repair shop for a service while I laid in. 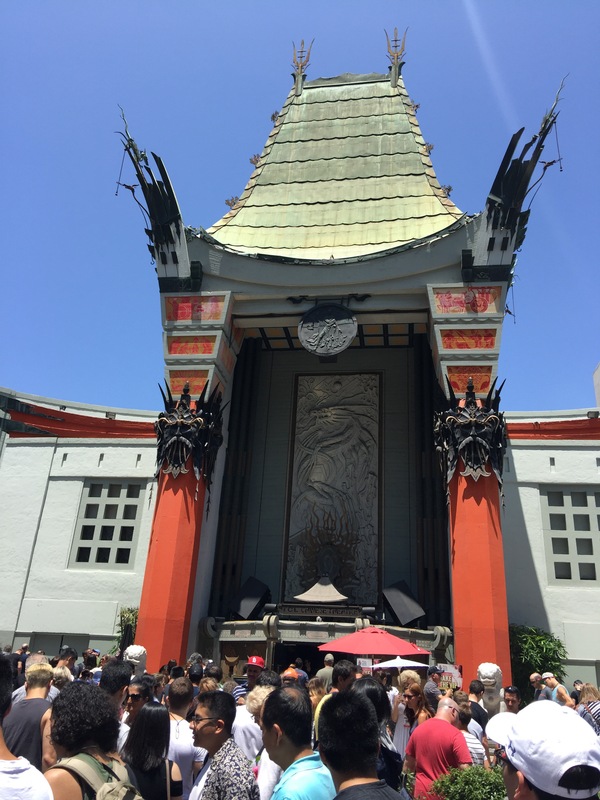 Our first stop on his return was the famous Hollywood walk of fame and the Chinese and Dolby theatres. The whole area has been much improved since we were both last here as teenagers. The walk of fame was crowded and bustling with tourists from every nationality. We spotted famous names such as Tom Cruise and even Donald Trump which someone had graffitied F**k You! In front of the famous Chinese Theatre are celebrities hand and footprints and we picked several out like Arnold Schwarzenegger and saw how our hands and feet compared. Impulsively we decided to watch ‘Dunkirk’ the new film in the theatre. We bought tickets and were seated ready for the next showing in 5 minutes. The theatre was grand and beautiful inside, decked out in red velvet. The film was enjoyable and a good way to see the famous theatre where the Oscars use to be held. In the evening we headed to some bars as it was a Saturday and had a bite to eat and some drinks. The whole area was busy with locals and tourists and the drinks were overpriced but there was a good vibe. Our next stop on the tourist route the following day was Beverly Hills. 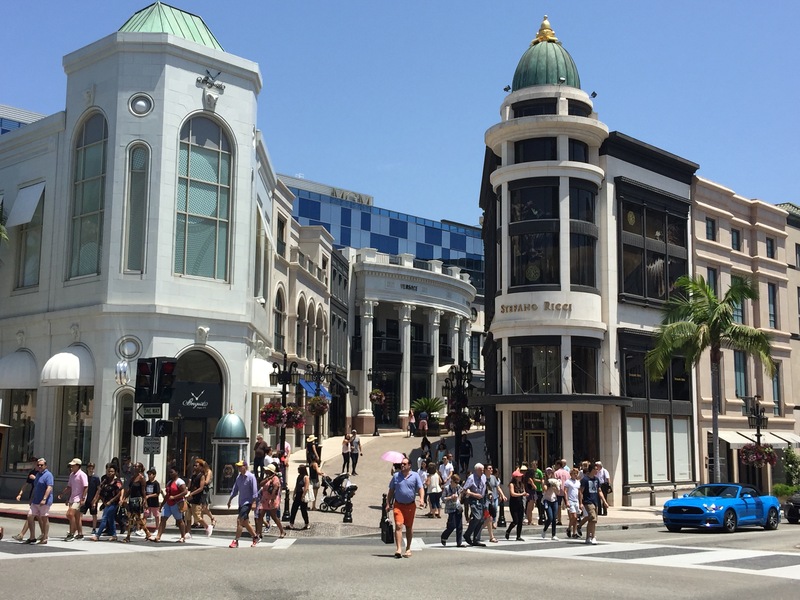 We walked the famous Rodeo Drive full of designer shops, fast super cars and palm trees. We visited the famous civic centre and sweltered in the heat and took in some lunch and browsed the shops. We ate and cooked at the Airbnb to save some cash and had an early night. 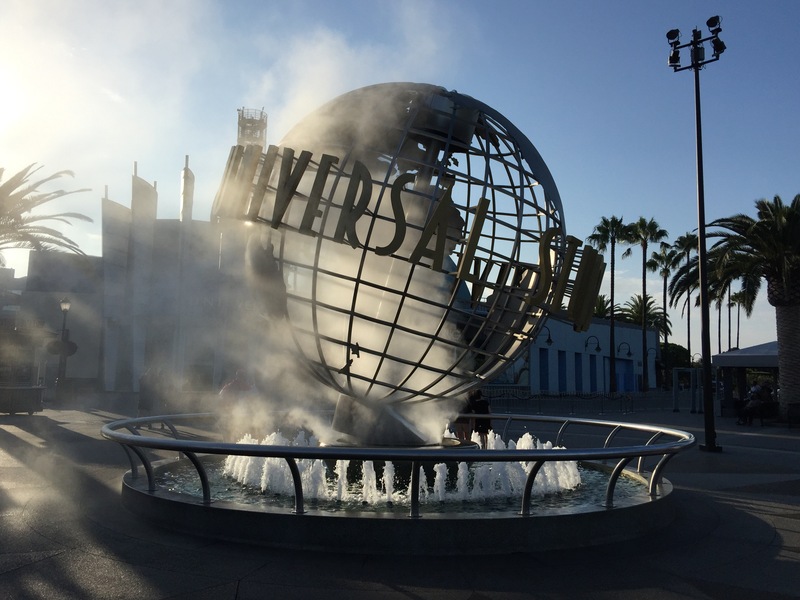 On the Monday (our 10 year anniversary), we headed to Universal Studios. Only a short metro stop away from where we were staying we got their early hoping to beat the crowds. To our surprise we were let in about 7:15am, 45 minutes before opening. We headed straight for the most popular rides in the Harry Potter zone. Queues where less than 5 minutes and by 10am we had done most of the main attractions. Particular favourites where the Jurassic Park, Transformers and Mummy rides. We then took the backlot tour through the sets of various films from Jaws to War of the worlds. The tour also included some ‘ride’ sections like King Kong and Fast and the Furious. Pets of the backlot where active and we could see preparations for the filming of Will and Grace and other shows. Many of the backlot fake buildings have been used in a variety of movies and tv shows from Back to the Future to Desperate Housewives. Next we took part in two shows: The Special Effects and Water World. The first was good and explained how various motion capture and sound effects are recorded. The show included stunt men who were punched, kicked and set on fire as well as some audience participation. 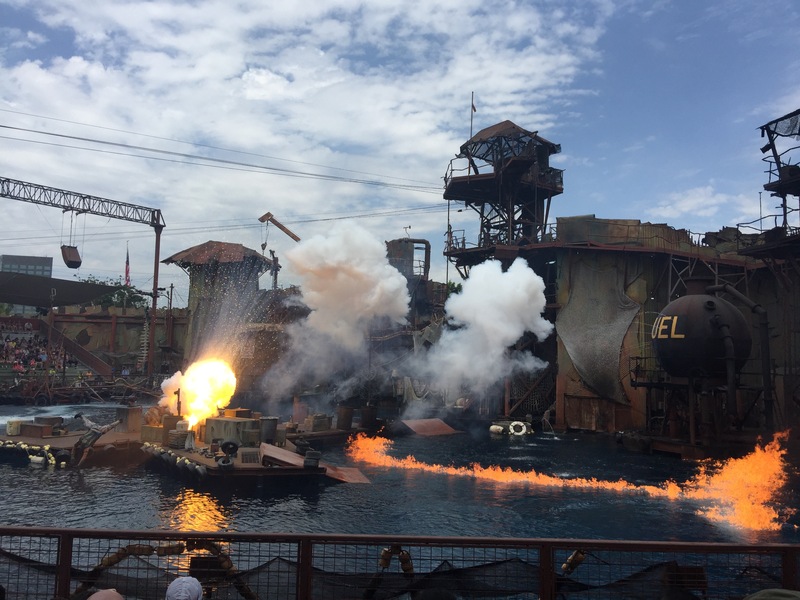 The Water World show was as we remembered it; full of fire and corny lines. The sea plane explosion was unexpected though and well done. We had some lunch in the park at Moes Tarvern and a Duff beer. We played some fair ground type games and won a large soft toy Minion and a Mike won a Minion basketball. What we were going to do with them who knows! It was an enjoyable day and we had some fun being kids again. The following day we went an collected the drone from its service and were taught a couple of new tricks from the repair guy. Then in the afternoon we hiked up to the famous Hollywood sign. We walked through the Hollywood hills, past some massive houses following Googles directions. We got lost several times and after scrambling up a hill and peering over a security fence we got to see the sign up close. We weren’t prepared to walk back so we hired an uber to come get us. That evening we went out for some drinks for my birthday which was the following day in the same area we had been in at the Weekend. The restaurant was nice and we enjoyed some wine and cocktails. Our last day in LA (and my birthday) we took the metro to Santa Monica pier and beach. The metro took hours and we eventually got there later than we had planned. The pier was busy as was the beach and after looking at them we walked along the boardwalk to Venice beach. 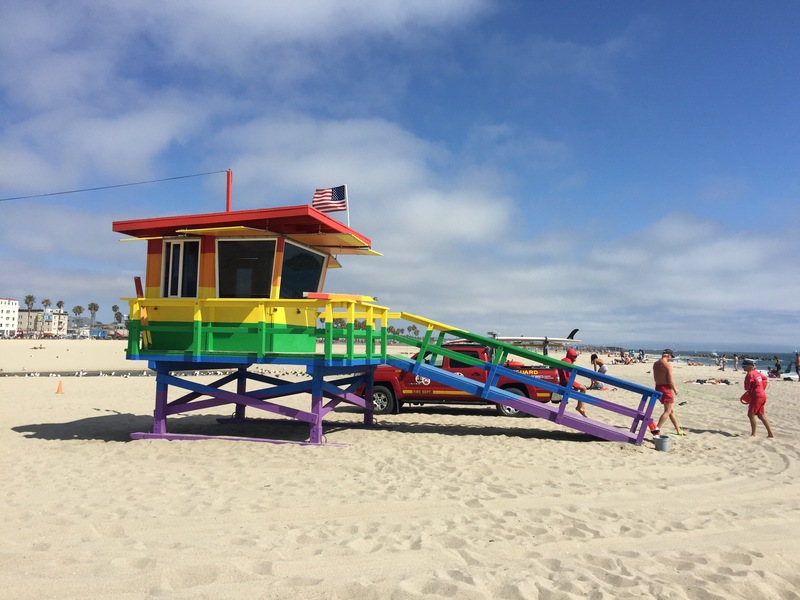 It took about an hour as we passed the famous life guard towers and the very wide beach. At Venice beach we had some lunch and beer and then went at looked at Muscle Beach and the skate park. Many guys were working out in the hot sun showing off to the tourists and in the skate park kids and adults performed tricks as well as falling over. We posed for some photos on the beach next to the life guard towers and decided to take an uber back. The uber took hours however with the LA traffic and we had to abandon it at one point at take the metro. LA had been fun and if you have money would be a great place to live. Next stop San Francisco.